An angry mob drives Jesus out of town to the edge of a cliff. My Synoptic Gospels teacher, Cassian Corcoran O.F.M., imagined this scene: he figured that Jesus moved along with the crowd stepping backwards and back again deftly blending with the pushing mob until he was finally at the back end of the crowd. Then he finally turned around and walked away. Why were they so angry? Jesus started out graciously enough. But Jesus doesn't stay in the gracious zone long before insulting the faithful. God's grace comes not to those toiling away at righteousness, he says, but to the unprepared outsider. 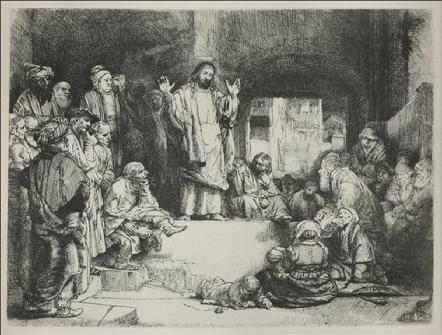 Citing the widow of Zerephath and Naaman the Syrian who received the graces of God in the time of Elijah and Elisha, Jesus implies that the kingdom unfolds in the least expected, most distasteful places. That's enough to incite the faithful to violence. Now, the home-town son becomes outsider. This week's prompts for meditation invite identification with the outsider. First, to strive to live as if the world is liberated, and meeting the challenges this form of resistance takes (Meditation One). Then, to consider a loss of self-interest so thorough, that "I" becomes "You" (Meditation Two). Finally, then, to consider the cost of this form of resistance and identification (Meditation Three). As far as possible, we ought to live as we believe we should live in a liberated world, in the form of our own existence, with all the unavoidable contradictions and conflicts that result from this.... Such endeavor is by necessity condemned to fail and to meet opposition, yet there is no option but to work through this opposition to the bitter end. The most important form that this will take today is resistance. I sat there in awe as the old monk answered our questions. Though I'm usually shy, I felt so comfortable in his presence that I found myself raising my hand. "Father, could you tell us something about yourself?" He leaned back. "Myself?" he mused. There was a long pause. To follow and to participate in the unfolding of that narrative is also to be open to its costs. It is to be with and to become the outsider. It is to live with the puzzling particularities and with the edge-people through whom God is manifest. It is to risk the journey in the desert, the trek to the Jordan, the headlong plunge down the hillside, the journey to Jerusalem, and the cross. I really wish I was less of a thinking man and more of a fool not afraid of rejection. It takes only seven verses for Jesus to go from “gracious” to getting himself nearly hurled off a cliff. At first the home-town boy is the ultimate insider -“Is not this Joseph's son?” - until he pushes on truths beyond the comforts of the righteous. All in the synagogue were filled with rage. Jesus, now the ultimate outsider, exits stealthily. Have you noticed that The Holy seeks you more ardently in your outside-ness than in your inside-ness? Belonging is nice. Comforting. Affirming. Even nurturing. But as you remember your journey in faith, is it not when you stood with the marginalized that you most perceived the presence of the divine? And wasn't it when you pressed into the unknown against the boundaries of your own heart and mind and soul that you experienced something more revelatory? Something inaccessible to mere righteousness? It is not easy to be righteous. But it's even harder to go through righteousness and come out on the far end of it with a heightened sense of graciousness. “Today this scripture has been fulfilled in your hearing.” Listen. Can you hear it? "We may be surprised at the people we find in heaven. God has a soft spot for sinners. His standards are quite low." Jesus said, “I took my place in the midst of the world, and I appeared to them in flesh. I found all of them intoxicated; I found none of them thirsty. And my soul became afflicted for the sons of men, because they are blind in their hearts and do not have sight; for empty they came into the world, and empty too they seek to leave the world. But for the moment they are intoxicated. when they shake off their wine, then they will repent.